Combat Earplugs Lawsuits Filed Against 3M. Find Out If You Are Eligible. If you were issued and used defective dual-ended combat earplugs from 2003-2015, you may be entitled to compensation. What has the U.S. government said about this issue? As part of a procurement fraud lawsuit, the United States government alleged that “3M dual-ended Combat Arms™ earplugs—which were standard issue in certain branches of the military during foreign conflicts between 2003 and 2015—have likely caused thousands of soldiers to suffer significant hearing loss and tinnitus in addition to exposing millions to the risk caused by 3M’s defective earplugs.” The U.S. government and 3M settled the allegations of procurement fraud for 9.1 million dollars. Are service members entitled to any portion of the combat earplugs settlement funds? No. The settlement was part of a False Claims Act lawsuit alleging procurement fraud by 3M. However, service members who have been injured can pursue individual claims. How can service members be compensated for injuries sustained from the use of 3M dual-ended Combat Arms™ earplugs? In order to be fully compensated, service members may wish to consult a lawyer in order to examine whether they have a valid claim against the manufacturer of the earplugs. What do the dual-ended earplugs look like? 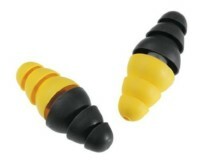 The earplugs have two ends and are yellow and olive. Some may perceive the olive color as green or blue. However, they are the only dual-ended, dual-color earplugs issued to service members during the time period 2003-2015, so if you were issued such earplugs, those are the ones involved. What is the latest news on such claims? Are there any time limits on filing a claim? Yes. If you believe you have suffered injuries due to the use of Combat Arms™ earplugs, you may wish to consult a lawyer promptly. If you wait too long, such claims may be barred by the applicable statutes of limitation. To consult a lawyer at Webster Book LLP, you may fill out the contact form below or call us at 888-987-9991. Did you use dual-ended earplugs during your service? Have you been diagnosed with hearing loss or tinnitus? Select An OptionHearing loss.Tinnitus.Both.Neither.I don't know. If so, was the diagnosis after 2003? Select An OptionYes.No.I don't know. Thanks. We’ll give an update on the litigation from time to time to keep everyone posted.